Whether you're a devout Christian or squirmy agnostic, there's no denying the power of the Easter story. 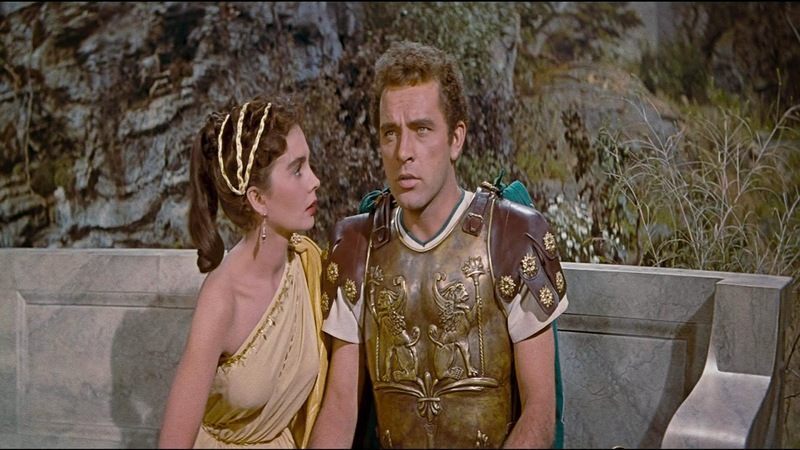 While Jesus doesn't even get a credit in the 1953 production, his presence is felt throughout The Robe, the film based on the novel by Lloyd Douglas. 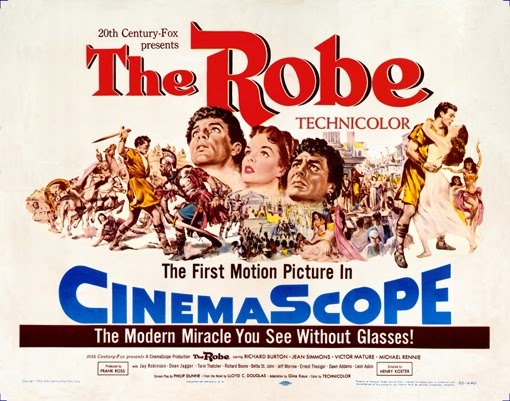 The first ever film shot in Cinemascope, The Robe earned five Oscar nominations including Best Picture and gave us our first widescreen look at the action, earning Leon Shamroy an Academy Award nomination for Best Cinematography/Color — back in the days when they still made the distinction between films shot in black and white and those shot in color. Color was still so new and splashy, it would seem an unfair advantage I suppose. For you super nerdy tech types you can dive deeper into Cinemascope at the widescreen museum here. While The Robe didn't win Best Picture and Burton didn't win Best Actor — that prize went to William Holden for Stalag 17*— the film did take home the prize for Best Art Direction-Set Decoration and Costume Design so it's definitely worth watching. 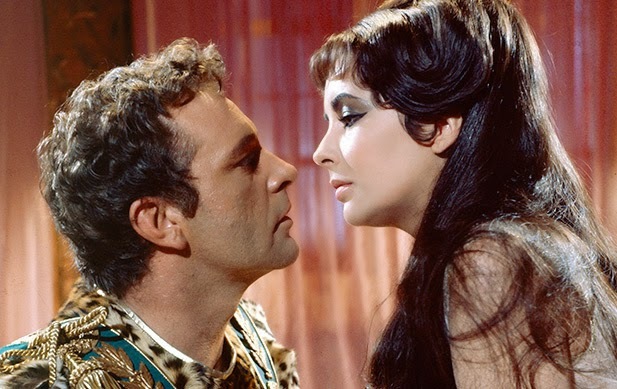 It would be another ten years, not until 1963, that Burton would take on the iconic role of Mark Antony opposite Elizabeth Taylor in Cleopatra. The larger than life couple's explosive real-life love affair was as drama-filled and addictive to film fans as any of their reel-life love affairs. That's the time period and the behind the scenes world that Jess Walter fictionalizes in his beautiful book, Beautiful Ruins, one of my all-time favorite novels supposedly headed to film land. While Imogen Poots is attached to play Dee Moray, the film is still listed as being in development. 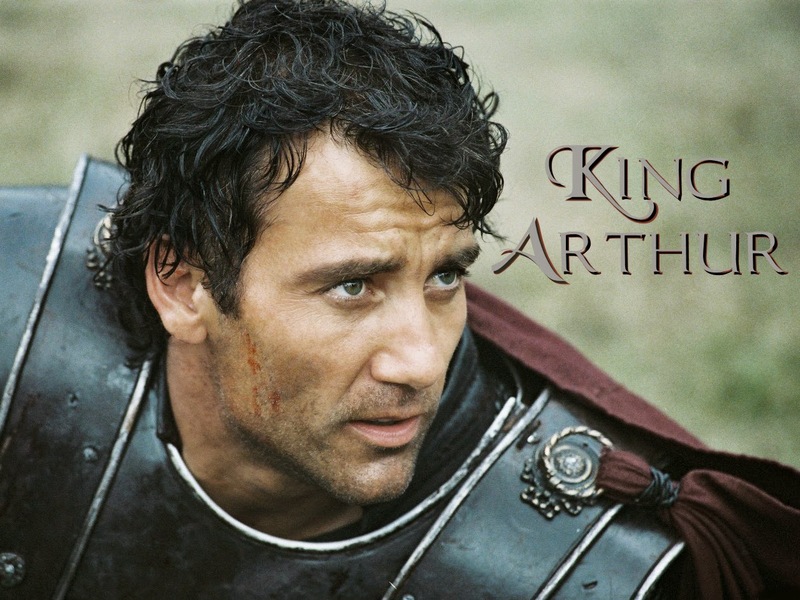 I'd love to see Clive Owen playing that 'beautiful ruin' Richard Burton. And if Angelina Jolie ever does get around to remaking Cleopatra, I'm going on the record I'd like to see Owens in that too. * 1953 was an amazing year for film and Burton was in great company as a loser! Also nominated for Best Actor that year, Montgomery Clift and Burt Lancaster for From Here to Eternity and Marlon Brando for Julius Caesar. He played Marc Anthony tooBrando won the year before for his tour de force portrayal of Terry in On the Waterfront.